Spring time in Florida. The warmer weather, and occasional rain storm is bringing most trees and plants into bloom. This is a busy time of year, especially for the honey bee. Early Spring is when colonies that have become overpopulated begin to swarm. When this happens, the Queen will leave with a group of bees, in search of a new home. The group will stick close together as they move from place to place, and can take up temporary residence, anywhere they see fit. 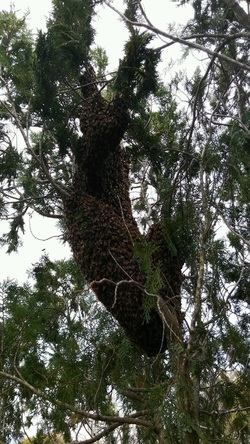 This is a picture of a large swarm found in New Port Richey, Fl. Sometimes, just mentioning bees to people, is enough to make them cringe. We understand. Honey bees have a nasty sting, but typically will not sting unless provoked, or defending its nest. Several years ago, while our Arborist was removing a tree in Clearwater, he cut into a hive that was dormant due to the cold weather. He ended up getting stung several hundred times in the face, neck and arms, and was rushed to the emergency room. We understand why people cringe at the thought of bees! Though their sting can be painful, their presence is vital to our existence. Bees are nature's most efficient and effective pollinators. Without them, we are unable to produce food. We believe that every bee is worth saving. In fact, we feel so strongly about this, that we have started our own apiary, and bee removal / rescue service. We have a State licensed Beekeeper on staff, and are fully licensed and properly insured to offer bee removal services. ​ Contact us today, or go over and check out our sister site at www.ifbeescouldtalk.com. Thinking of planting a tree in your yard? Proper tree placement is the key. There is more to planting a tree than just digging a hole and putting a tree in it. This will help you decide not only which tree you plant, but where you plant it. This picture was taken right after renovations were completed on the Walmart storefront. 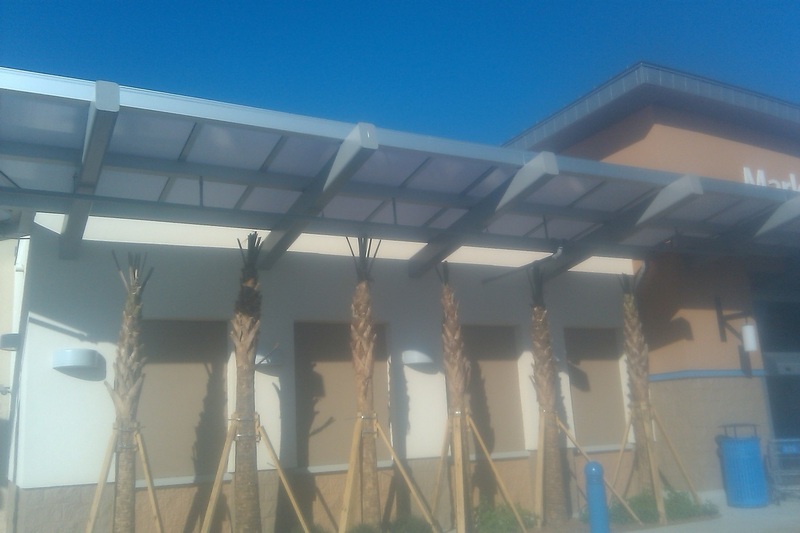 Clearly the landscape design was drawn up in an office somewhere else, and not much foresight went into this palm installation. The problem was corrected soon after this picture was taken. Trees can be a valuable asset to your property, but if they are planted incorrectly, or in the wrong spot, they can quickly become a big problem. For instance, planting a tree with an invasive root system like a Laurel oak, too close to your driveway, can cause your driveway to crack and raise. Planting a fast growing tree, with brittle wood like a Red maple, too close to your house, can create a situation where branches frequently fall and hit the roof. On the other hand, if you plant that same fast growing Red maple far enough away from your house, you will be able to enjoy the dramatic color change it goes through in the fall, for many years to come. It is important to understand the growth habits, size capabilities, and space requirements for a tree BEFORE you plant it in the ground. We frequently meet with people who planted trees too close to their home, because it was so small when they planted it, and they never knew it would get as big as it did. Unfortunately, in these circumstances, there is little that can be done, other than removal. Another thing to consider is, sunlight. Some trees require lots of sun in order to thrive, while others do not. This is important, because a sun deprived tree will never grow to its full potential. A good resource for information on what trees to plant in Florida is The University of Florida Institute of Food and Agricultural Sciences website. 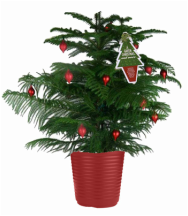 The Norfolk Island pine tree is commonly found in stores as a pre-decorated Christmas tree. They are compact, and ideal for smaller spaces, and they stay green indefinitely with proper care and watering. The common draw to them is, they can be planted in your yard to grow for years to come. As with any other tree that you plant in your yard, we suggest that you do your homework, and find out the growth habits, and what the tree will require as it begins to grow... RAPIDLY. The average maximum height of Norfolk Island pine trees in Florida, is 80 feet, though they can easily grow taller, some even exceeding 100 feet. The reason for this is fairly simple. The average height of the rest of the canopy is 80 feet. When a tree extends above that range, the risk of being struck by lightning increases greatly. Fast growing tree that does well in most conditions. Usually multi-trunk in pots, but should be reduced to single before maturity. Cones are rare, but can weigh up to 10-12 lbs. Can have intrusive roots near trunk. 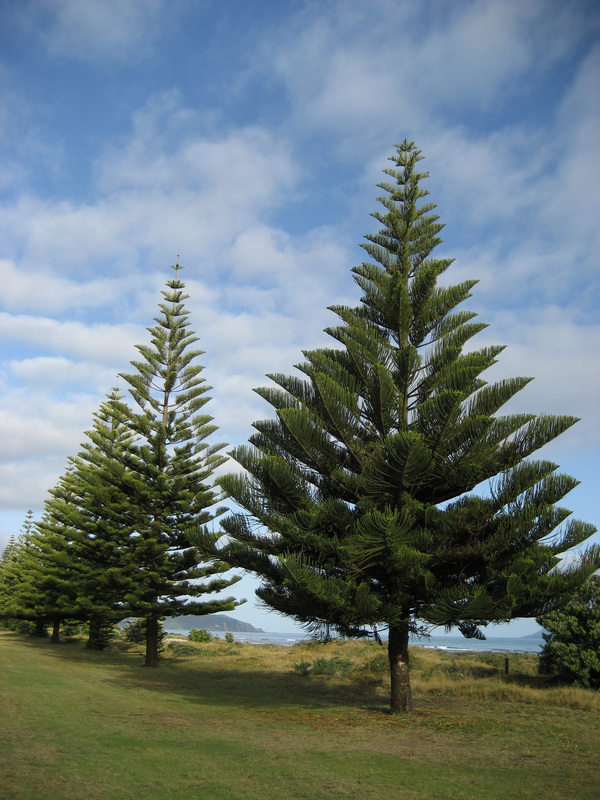 The Norfolk Island Pine tree is actually not a true pine tree. It is a member of the ancient, Araucariaceae family. The name Norfolk Island pine, indicates it is endemic to a small island in the Pacific ocean, between New Zealand and Australia, called Norfolk Island. These trees are commonly seen on rocky shores and are known to withstand strong winds severe weather. Often, trees with multiple trunks are selected for their symmetrical shape. While this is fine for smaller trees, it is recommended that a single trunk be selected to remain, and all others properly removed over time. Weak branch attachment is one of the leading causes of failure in Norfolk Island pines. 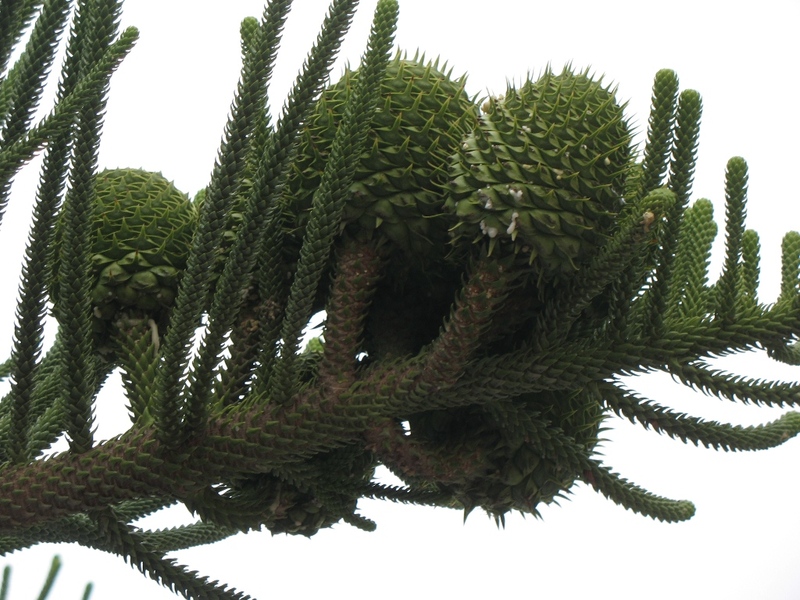 Though rare, the cones produced by the Norfolk Island pine tree can weigh up to 12 lbs. and remain on the tree for approximately 18 months. Several counties in Florida, prohibit people from planting the Norfolk Island pine in the landscape. Though it is not an invasive species, it is often considered a hazardous tree due to it's fast growth, and weakened branch attachments. These trees are also very susceptible to lightning strikes as they mature, because they quickly become the tallest point in the landscape. If you have a tree that has been struck by lightning recently, act quickly. It is imperative that sick, dying, or dead trees be removed in a timely manner, as they do not tend to stand long. If you have any other questions regarding the Norfolk Island pine, please let us know. And as always, we look forward to the opportunity to care for your trees. Call or click, and we will schedule a free estimate with our Certified Arborist. Mango Trees in Your Yard? Do you have a Mango tree? Are you interested in installing one? I have a few tips for those who do, and some insight for those who are thinking about planting one in the future. With the rapid decline of Citrus trees in and around Pinellas County, and their uncertain future looking ahead, I rarely recommend that anyone attempt to plant them. They just aren't doing well in Florida anymore. Because of this, I am frequently asked what type of fruit tree should be planted instead of Citrus? As I run down the list of fruit trees that thrive in Florida, the one that usually stands out the most, is the Mango tree. The Mango is universally considered as one of the finest fruits, and one of the most important fruit crops in the tropics, and subtropics. While Pinellas County is at the northern edge of the Mango tree's hardiness zone, the tree can still thrive here. Mango trees usually do not bear fruit until they have been established for 3 to 5 years. Once the tree has reached maturity, it can produce 4 to 6 bushels of fruit per season. The Mango tree does not tolerate cold temperatures. Young trees can die if the temperature drops below 30 degrees for only a few hours. This means that they will need some type of protection from the cold, until they begin to mature, and even then, some leaf damage, and twig dieback is to be expected when the temperatures drop below 40 degrees. If temperatures drop below 25 degrees, for as little as a few hours, mature trees can die. One common complaint that I hear from customers who already have Mango trees is, 'This thing produces more Mangoes than I would eat in a lifetime, in just one season.' The canopy of a healthy, mature Mango tree can spread as far as 100' and can reach a height of 30' and can produce up to 6 bushels of Mangoes, in one season. As with any fruit bearing tree, there is a very good chance that opportunistic pests will begin to take a liking to your Mango tree. Mangos are a main staple in the diet of fruit rats, and even squirrels have been known to take bites out of Mangoes while they hang in the tree. Mango trees are susceptible to many different types of insect pests, but seldom does this limit fruit production. The two main causes for decline and death in Mango trees are, Anthracnose, and Powdery Mildew, both fungal pathogens. 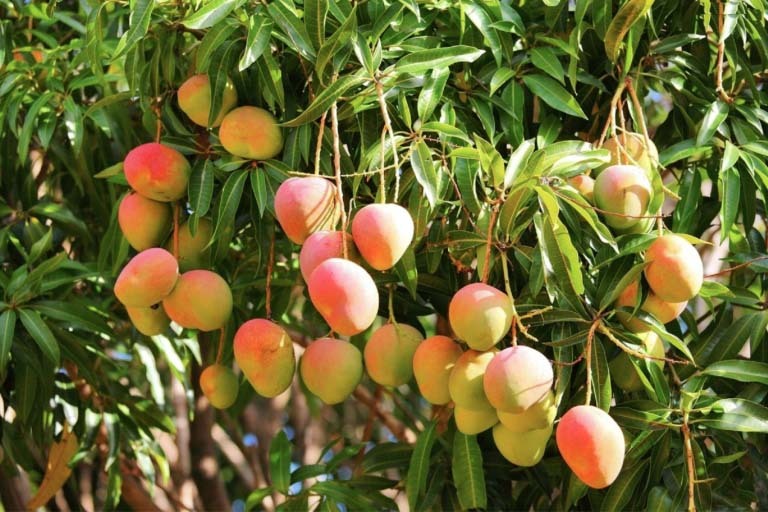 Once established, Mango trees require very little supplemental watering, usually only during periods of drought. Do not apply supplemental water to leaves, or blooms. Mulch around the base of the tree is suggested, but only a thin layer. Fertilization is recommended in order to produce a healthy fruit crop. As with any tree, the best mulch to use, is the leaves that fall from the tree, as they break down and become fertilizer for the tree. If you have more questions, or would like to learn more about this or any other tree, please don't hesitate to contact us. We would be happy to schedule an appointment. Leaves are Falling on Your Lawn? Now that the temperatures are beginning to drop, here in Pinellas County, so are the leaves. Did you know that allowing the leaves to stay on the lawn can greatly improve the health of your trees, landscape and lawn? Each fall, homeowners spend hours raking, and bagging all of the leaves from their yards, only to put them curbside to be taken to the landfill. Each spring, those same homeowners spend lots of money to fertilize their lawn, landscape and trees with fertilizers that may not even be what the tree needs. This cycle of stripping the soil of the natural nutrients, and replacing them with artificial, and unnecessary chemicals can lead to many different problems in the future. Leaves are packed with trace minerals that trees draw up from deep in the soil. When allowed to remain on your yard, leaves feed earthworms and beneficial microbes. They lighten heavy soils and help sandy soils retain moisture. They make an attractive mulch. They're also a great source of carbon to balance the nitrogen in the soil. And they insulate tender plants from cold. Allowing leaves to breakdown in the landscape is a great way to 'build soil'. Florida soil is made up primarily of sand. Sand, by itself, does not retain moisture or nutrients for long, as they leach through the sand quickly. 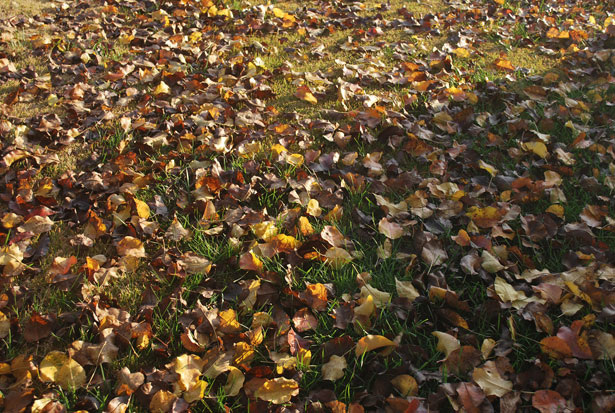 As leaves begin to breakdown, or 'compost' they retain moisture, allowing it to be more readily available to the trees, plants and grass in your landscape. As they compost further they create beneficial, natural, nutrients and they're free! Skip the Rake! Leave the Leaves!! When it comes to palm tree pruning, or palm tree trimming, what is the proper way? Many tree services seem to think that when it comes to trimming palm trees, More is better. It only makes sense. "The customer is paying me to prune their palm tree, so I am going to cut off as much as I can to provide the best tree service I can". What many don't realize is, More is definitely not Better. Though palm trees have more in common with grass, than they do with trees, this doesn't mean they are able to withstand the same harsh treatment. Photosynthesis occurs in the green fronds. This helps to feed the palm tree. Removing too many green fronds from a palm tree, causes stress. A stressed palm tree isn't able to process nutrients the way it should, resulting in a sick palm tree. As a rule of thumb, we use a clock as a reference. If you can, picture a clock at the top of the palm tree. The proper way to prune a palm tree, is to remove all fronds that hang below 9:00 and 3:00. All fronds above that, should stay. Seeds, and seed pods can be removed, but care needs to be taken not to "nick" (cut the outer surface of stem) the fronds, as this will cause the fronds to break and hang. If Trees Could Talk sets the standard for proper palm pruning. We use only hand saws, no chainsaws, to trim palm trees. This allows us more control, so we can be sure that we don't nick any fronds. This is the type of attention to detail that we pay for each and every one of our customers. My friend Loren once said, "You can tell a lot about an Arborist, by how they prune a palm tree." He used to say that if the person pulled out a chainsaw, he knew then that they weren't doing it right. Well Loren, today, I think I made you proud. Foot Rot on a Citrus Tree. This is a fungus that can kill a healthy tree quickly if gone untreated. This is commonly found in mature citrus trees in low lying areas or in yards that receive too much water. Once this fungus takes over, you can expect to see small lesions forming on the trunk, and spreading up through the branches. If you notice bark beginning "peel" on any part of your citrus trees, it is time to act. Treatment of this fungus is successful in most instances when caught before damage becomes too great. Call today or Contact Us. Citrus Trees in the Winter. The winter of 2009 was one of the worst on record here in Florida. Our Citrus crop took a real hard hit from the low temperatures that seemed to be never ending. Now is the time to have our Arborist take a look at your trees and go over all of the proper steps you should take to ensure a healthy crop of fruit next year. It's easier than you might think and all it takes is one phone call. 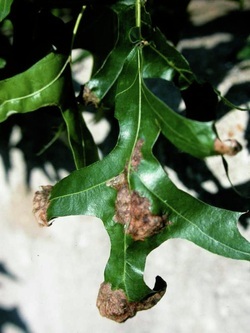 Oak Leaf Blister (Oak Leaf Curl) This is a fungal leaf disease caused by the fungus Taphrina caerulescens. During cool wet springs, almost every variety of Oak is susceptible. During mid-spring, microscopic spores are produced in leaf spots. These spores are carried by wind and splashing raindrops onto bud scales and twigs where they remain in a dormant stage until the following early spring. At this time, rain washes the spores onto young leaves where infection takes place. Depending on weather conditions, small circular spots begin to develop in 2 to 4 weeks. Spores produced on these spots will lodge in bud scales and again remain resting until the following spring. Cool wet weather is required for germination on young leaves, and if these conditions continue, severe infection can occur. Fungus at the base of a tree. 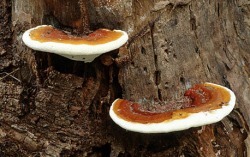 Ganoderma applanatum- This is a bracket fungus that thrives on rotten or decaying wood. The conch that is visible is actually the fruiting flower of the fungus. 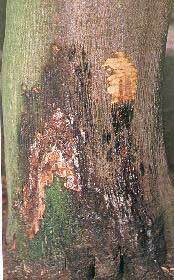 This fungus is a bad sign when it appears on your trees because it indicates the presence of rotten and decaying wood. It is not a species specific fungus, this means that it can appear on a wide array of trees from small Palms (which are not even trees to begin with) all the way to the mightiest of Live Oaks. If you notice these conchs on the trees in your yard, it might be time to have a hazardous tree assessment performed by our Arborist. Contact Us so we can take a look at your tree to determine how severe the problem is, and help in the decision making process of "what happens next?" An ISA Certified Arborist with 11 years of experience. Expert in problem diagnosis and treatment.